When you’re out and about, you’ve probably noticed more and more teens have their noses buried in a phone. The latest report from Nielsen shows teens are significantly increasing their monthly data usage – more so then any other age group. 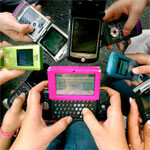 When looking year over year at Q3 from 2010 to Q3, 2011, teens have increased their monthly data usage from 90 MB to 321 MB - that is an increase of 256%! While they still do not consume the most data in terms of megabytes, that title goes to 35-34 year olds with 578 MB, the increase we’ve seen in the last year may eventually push teen data usage as high or above older groups. If anything, parents who are getting their teen their first phone should definitely be considering an unlimited messaging plan. i am 16 too and i barely manage to reach 100 texts in a month...but i do consume alotta data...like 5 gigs maybe. I feel really old. I am 16 and rarely message. My messages never exceed 100 per month. That's in the senior citizen groups ! Sorry that would out be 10 not 100.
love it! lol im 22 but if i had the friends i'd be rockin txts like your age group haha but data is easy. :p especially when you tether! I'm 20 and i send about 5000 messages receive about the same a month and my monthly data usage is around 1-2GB. I use about 15gb of data a month lol screw texting. What the hell they have to say in those 3000 text? I don't think I could text that much in one month if I tried...I would give up and do something else halfway through. wow, these teens obviously have no real life. I send like 5-10 messages per month.